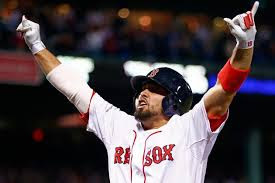 Shane Victorino was traded yesterday. It was the right move to make as the Red Sox go into 2016 preparation mode. The trade ends Victorino's career in Boston. While he was injured often the last two years nothing can take away the 2013 season where he was one of the most important players on the eventual World Champions. His career in Boston can be summed up best by the 7th inning during Game 6 of the 2013 ALCS. The Sox were down 2-1 and the bases were loaded. Victorino walked to the plate as Bob Marley's Three Little Birds blared over the speakers. The fans began to sing along and Victorino went deep sending the Red Sox to the World Series. Everything truly was going to be alright. Aloha!